The Young Leaders are hoping to educate villages about the use of natural fresh water springs to sustain livelihood. It will also seek to embark on conservation of crayfish. To this end, the Young Leaders will undertake the task of restoring a water tank in Fancy and enhance existing springs in surrounding communities. The principal of the Sandy Bay Secondary School Brendon Child in addressing the gathering at the launch stressed the need to preserve the water supply for the future and encouraged the students to work hard to achieve their objectives. Headteacher of the Fancy Government School Ms Elna Michael also encouraged the students to work hard, and stated that she is happy to know that the students have chosen to undertake the restoration of the water tank in Fancy. 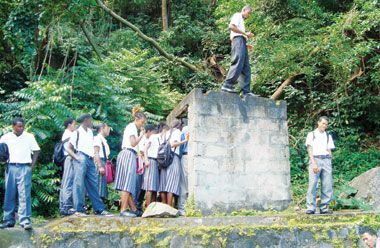 Meanwhile, President of the schoolâs Young Leaders group Elishava Hoyte urged the community to partner with the school as they embark on this project. The Sandy Bay Secondary School is hoping to dethrone last yearâs winner of the competition. On Friday, February 25, the Young Leaders journeyed to Fancy to start cleaning on the site. This work they intend to continue until the completion.